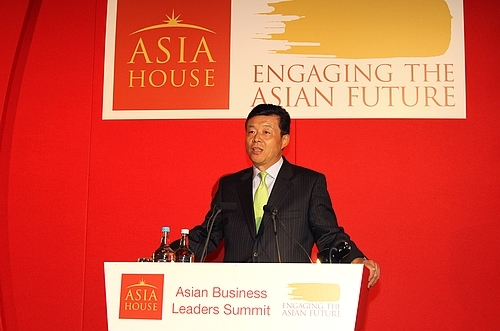 It gives me great pleasure to attend the First Asian Business Leaders Summit. 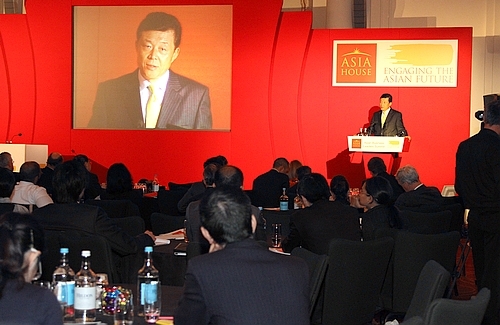 I wish to begin by warmly congratulating Asia House on the opening of this summit. As an ancient Chinese saying goes, "It is sunny in the east while rainy in the west." This may well serve as a summary of the current global economy, with the American and European economies are still just in the rainy season, as the result of the financial crisis, whereas the Asian economy is in the summer sun with robust growth. 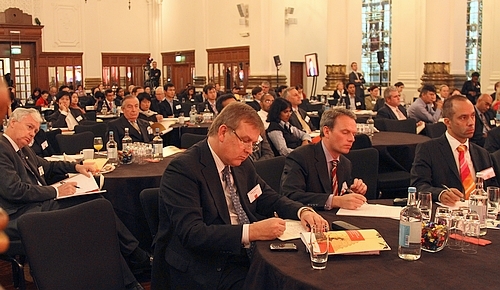 The latest IMF World Economic Outlook estimated that the Asian economy will grow by 6.7% in 2011. This will be lower than this year's 7.9% but still is enough to make it the fastest growing region. China's sustained fast growth has contributed to Asian and world growth over the past decade. And I would like to share with you my thoughts on China's economic future, investment climate and the RMB exchange rate, which I know has attracted much attention. China's economic future should be viewed with both a short and long term perspective. In the short term, the latest statistics point to strong momentum for growth. · The September PMI stood at 53.8%, 2.1 percentage points higher than that of August, above 50% for 19 consecutive months. China is at a crucial point, where a shift from fast to more sustainable levels of growth is imperative. And a reasonable slowdown will help prevent overheating, and assist economic restructuring and industrial upgrading. In the long run, China is in a fast process of industrialisation and urbanisation, with huge demand for investment and consumption. China's industrialisation is still at a much lower level than that of the advanced economies. But more than 300 million people will move from rural China to the cities in the next 20 years. And private investment now accounts for more than half of total domestic investment, and has become a major engine driving economic growth. The Chinese used to spend the largest part of their income on food and clothes, but now cars and housing have taken their place. Although there is a huge demand for cars, housing, tourism and high-end services across many areas of China, there are also less developed regions such as western China where food and clothing are still the essentials. This shows economic imbalances in the country, but can also be seen as great potential for further development. We have every reason to be optimistic about China's economic future. Let me now address the second issue: China's investment climate, which is of concern to you as business leaders and has been addressed by Chinese leaders recently. · And 45 million jobs in China. Firstly, increasing openness and transparency. Earlier this year, the Chinese government issued new rules which opened more sectors to foreign investment and channel more foreign capital into high-end manufacturing, high-tech industries, modern services, new energies and energy-saving and environment-friendly industries. Foreign companies will be encouraged to join in the reorganisation of Chinese businesses through share-holding, merger or acquisition, and will also be allowed wider access to Chinese funding. These measures will make it possible for foreign businesses to play a larger role in China's scientific innovation, upgrading of its industries and re-balancing of regional development. Secondly, promoting fair competition. The Chinese government's policy to encourage home-grown innovation applies to all companies in China, including all foreign-invested companies as their products are considered to be "made in China". In April this year, China held a public consultation to review the criteria for certification of products of home-grown innovation. The results reaffirmed that foreign-invested companies enjoy the same rules of origin as their Chinese counterparts. The Chinese government places great importance on the negotiations to join the WTO Government Procurement Agreement. And it will make all procurement and construction projects involving official funding open and transparent to all Chinese and foreign-invested companies and treat their products equally. Thirdly, improving intellectual property rights (IPR) protection. A full-fledged system of IPR protection has been set up over the last 20 years, making IPR protection a national strategy in China. Between 2006 and 2010, annual IPR protection action plans were drawn up. Law enforcement for IPR was strengthened resulting in a heavy clamp-down on acts of piracy. In the years ahead, we will continue to improve our market economy by removing market barriers, and protect the rights and interests of investors. China will also improve laws and regulations on IPR protection to offer more effective and efficient protection to investors and IPR owners. First, the RMB has not caused the global economic imbalances. Blaming the RMB is an attempt to shift responsibility. An important factor in the imbalances is the excessive spending and inadequate savings in some major economies, which has been reflected in trade imbalances, in particular the rising trade deficit of the US against emerging economies of Asia. Second, adjusting the exchange rate is not an effective way to promote the balance of trade. Take China as an example. It has a trade surplus with the US and the EU, but a deficit with Japan, ROK and ASEAN; it has a surplus in the trade in goods and processing, but a deficit in the trade in services and general trade. This clearly has little to do with the RMB exchange rate, but is actually a matter of the globalised trade structure. Take China-US trade for example, the RMB has been on an upward track against the US dollar since 1994, and has appreciated by 22% since July 2005 when China introduced reforms to the exchange rate regime. If what we were told is true, this should have led to a more balanced trade between China and the US. Yet the years from 2005 to 2009 only saw a growing US deficit. This proves once again that China-US trade imbalances are not caused by the exchange rate, but rather are a structural issue. I should also add that the US has failed to make full use of its comparative advantage by putting up barriers to the export of high-tech products. Third, a currency or trade war is in no one's interest. China has worked hard to overcome the adverse impact of the crisis. We sent buying missions to Europe, increased our Euro bonds holdings and helped some European countries out of difficulties. China also contributed 50% to world economic growth last year. A global economic recovery will only be possible if China maintains steady growth. Sharp RMB appreciation would not only be disastrous for China, but would also hurt the global economy. A currency or trade war is the last thing the global economy needs. As an old Chinese saying goes, "Cooperation benefits both and confrontation hurts all." And this is how we believe the currency and trade issues should be addressed. Fourth, it is inappropriate to label China as a currency manipulator, and China does not want its currency to be manipulated by others. China has put in place a managed floating exchange rate regime, based on market supply and demand with reference to a basket of currencies. This reform should be gradual and market-based and should proceed at a pace consistent with China's international balance of payments position. Some have asked for a one-off appreciation of 25 to 40%. This would mean a setback for China's exchange rate reform, and such "manipulative therapy" will not be adopted by China. Thanks to the joint efforts of the international community, we have put the worst effects of the financial crisis behind us and the world is moving towards recovery. Yet the recovery is still in a fragile and unbalanced state, and faces many uncertainties. In this post-crisis era, it is important that countries work together for an all-win instead of a "beggar-thy-neighbour" approach. As a driving force for economic development in Asia, China will continue to reform and open up wider. This will contribute to more economic growth and benefit our people. We will promote sustainable development by upgrading the growth pattern and driving a balanced growth through consumption, investment, export, along with scientific and technological progress and managerial innovation. China will stay committed to mutual benefit. Its development will not come at the cost of other countries' interests. On the contrary, it hopes to expand areas of common interest, so that other Asian countries and the rest of the world will share the opportunities that China's development brings. I do hope that business leaders here will fully exchange ideas, enhance mutual understanding and contribute your wisdom to the early recovery and sustainable growth of the world economy.